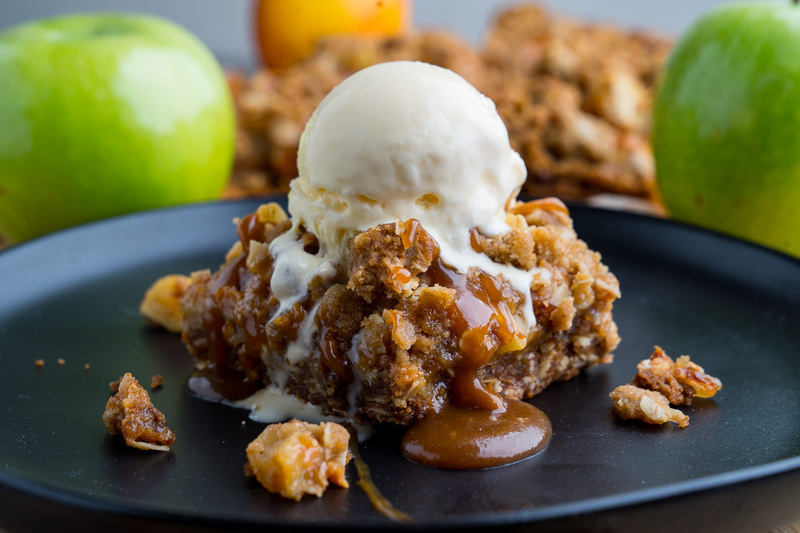 Apple crisp bars drenched in melted caramel and topped with a scoop of melting vanilla ice cream! 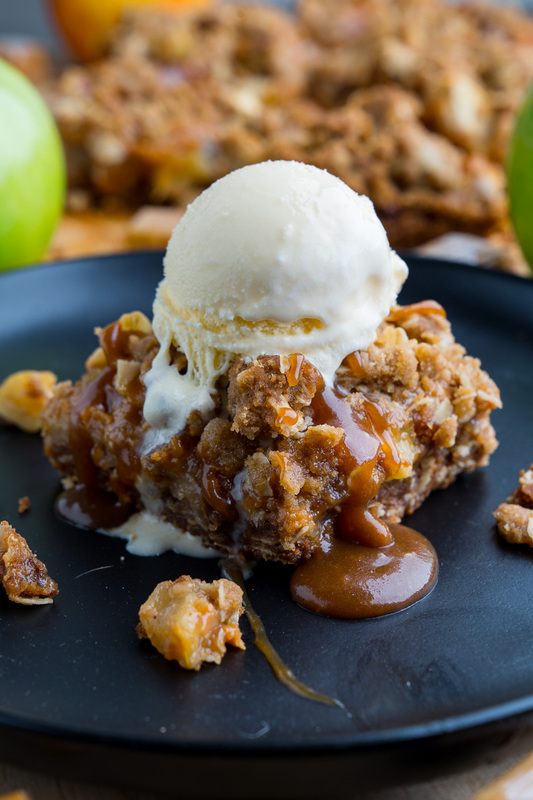 Apple crisp bars drenched in caramel and topped with a scoop of melting vanilla ice cream! One of my favourite things about fall is the apples and of course the best way to enjoy them is in a fresh homemade apple pie or crisp! 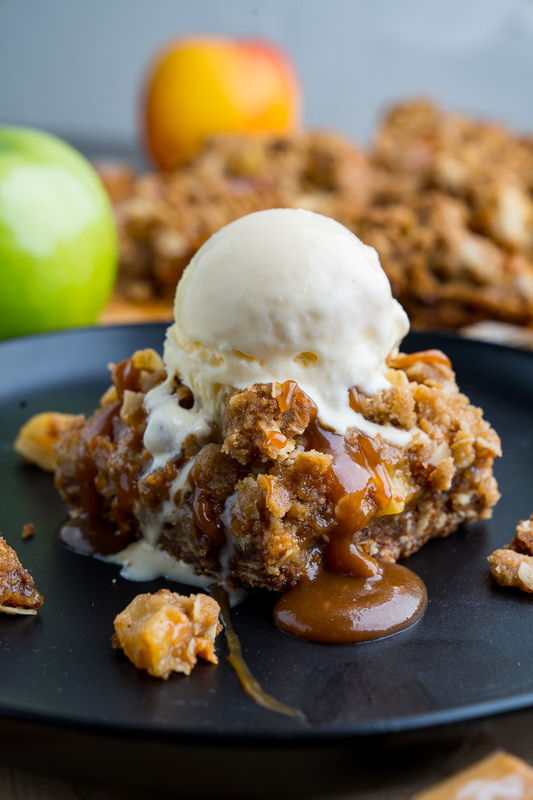 An Apple crisp is basically a simple version of an apple pie except that instead out using a pastry crust, you omit the bottom crust and top it off with a quick and easy crumble topping. A crisp is usually pretty messy, in that it’s just apples topped with a loose topping, so I like this version where I make it more like bars that are portable and can be hand held! 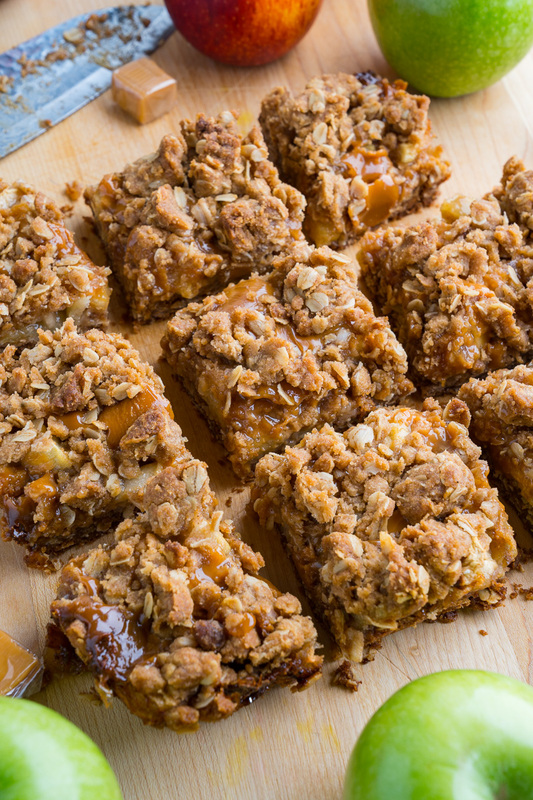 This is basically an apple crisp recipe with extra topping that is pressed into the bottom of the pan and pre-baked a bit to form a solid base for the bars. 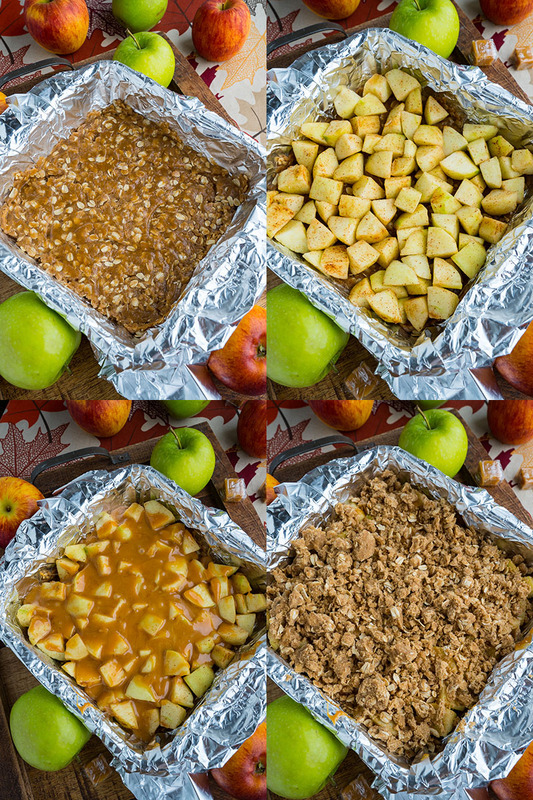 The apples are placed on top of the base followed by the traditional crumbled crisp topping. Apples and caramel are such an amazing flavour combination that I cannot resist pouring some on and although I usually like to make my own caramel sauce I sometimes cheat and make a quick one with melted caramel candies mixed with cream. I also like to sprinkle some coarse salt onto the caramel to add that hint of saltiness to the bars! 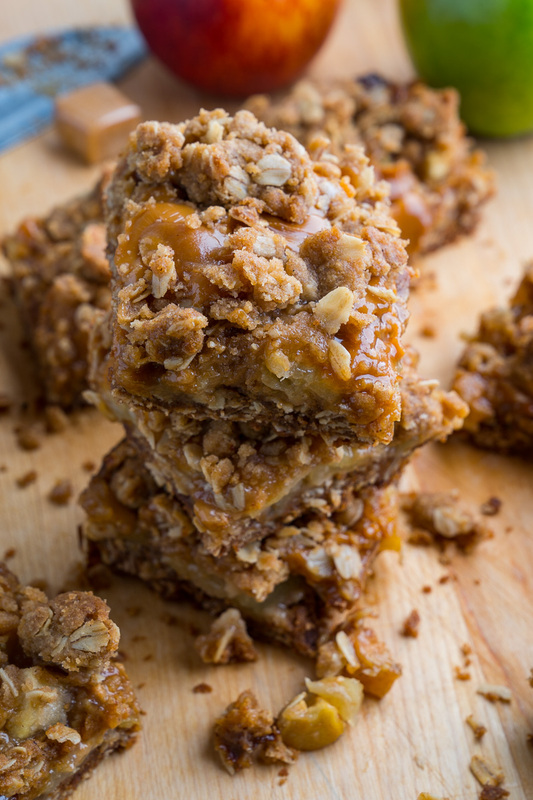 These caramel apple crisp bars are so amazing all by themselves but feel free to serve them topped with a scoop of melting vanilla ice cream! Mix the mixture of the flour, rolled oats, baking soda, cinnamon and salt into the mixture of the butter and brown sugar. Press the mixture into the bottom of a greased (or foil or parchment paper lined) 8 inch square baking pan and bake in a preheated 350F/180C oven for 10 minutes. Meanwhile peel and dice the apples. Melt the caramels into the cream in a small saucepan over medium heat and turn off the heat. Sprinkle the apples onto the bottom layer and pour the melted caramel sauce over. Mix everything, grab it by the handful, pressing it into large clumps, and loosely breaking them up as you sprinkle them onto the apples and caramel sauce in the pan. Bake in a preheated 350F/180C oven until the top is lightly golden brown and the sides are bubbling, about 30 minutes. Option: Sprinkle some coarse grain salt over the caramel sauce fr a salted caramel! Tip: Serve warm, topped with a scoop of vanilla ice cream! This looks soooo good – I can’t wait to try it!!! These bars look amazing! I need to make these for family night tonight! Oh yum! These were always a fave dessert choice for me at restaurants. Now that I primarily cook at home – these will be great to try! You seem to have left out a step. You say to melt the caramels and cream and then skip to the topping. Do you put the apples in the pan and pur the caramel over? or just mix them all together and then add to the crust????? I usually get this the of dessert at restaurants but now I will have to try making it at home. I can’t wait to get the ingredients and try it tonight!